Fearful of high places, the partridge roosts low in the branches of the pear tree. In the winter snows she dreams of the time of myths long ago, and the time to come when all spells are broken. In her dreams she is human again, and young and her name is Perdix as once it was. She was the niece and apprentice of that crafty craftsman Daedalos, and invented toys to amuse the baby Ikaros. From scraps of workshop metal she constructed intricate mobiles that she hung over the baby’s bed. They turned and spun in the warm wind from the window, winged figures and bulls, fruit trees with golden fruit, feathers spinning and falling, and they softly chimed. Daedalos was impressed, and not a little envious, but at least the skill was still in his family. Then the Sybil of Samos prophesied that Ikaros would die young and that Perdix had predicted his death in her toys. The prophecy though, as all prophecies, was garbled and incoherant. Daedalos, hearing it second-hand understood that Perdix would usurp his son’s place and bring about his death. 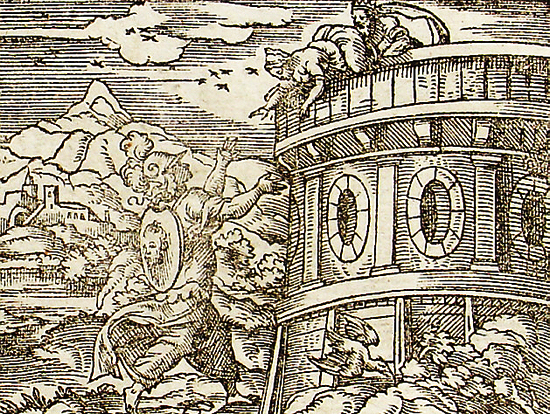 For this reason, he took the unsuspecting girl up into a tall tower and pushed her to fall to her death. The Goddess Athena, who favours the ingenious, saw Perdix fall and in the flick of an eye, to save her life, turned her into a partridge. These things the partridge dreams, or remembers, but she does not know the further story. For his crime, Daedalos was banished from his home to Crete, to the workshops of king Minos. There, with Ikaros his son, he lived in service to the Bull-King. The boy grew strong and brave, but without his father’s skill, and it irked him and saddened his father. Then one day, packed in a trunk in the darkest corner of the workshop, Ikaros found the mobiles that Perdix had made. He did not remember them, or only as if from a dream, but in the winged figures and the feathers he saw a means of escape and a means to win his father’s admiration. Unable to construct the wings himself, he took the idea to his father, but concealed the true origin and pretended the wings were his own idea. Daedalos was delighted with his son’s plan, and even more that his son at last had had an original thought. The wings were made and the two captives flew, but (as the story is told) Ikaros flew too high, too close to the sun. The wax that held his wings together melted, and in a cloud of loose feathers he fell, as Perdix had fallen. 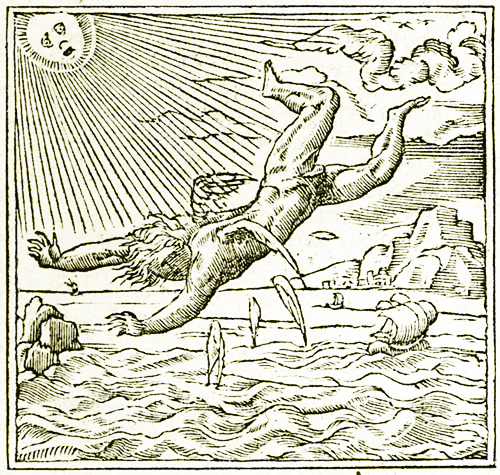 But for Ikaros, who had never shown the slightest ingenuity or craftsmanship, no goddess watched, and he plunged to his death in the sea, leaving Daedalos to fly on, weeping. What will happen, do you suppose, when all spells are broken and the partridge in the pear tree learns the full story of the end of Ikaros and Daedalos? Will she too shed a tear? Or will she let a feather fall, spiralling down, as she laughs at the irony of the gods?